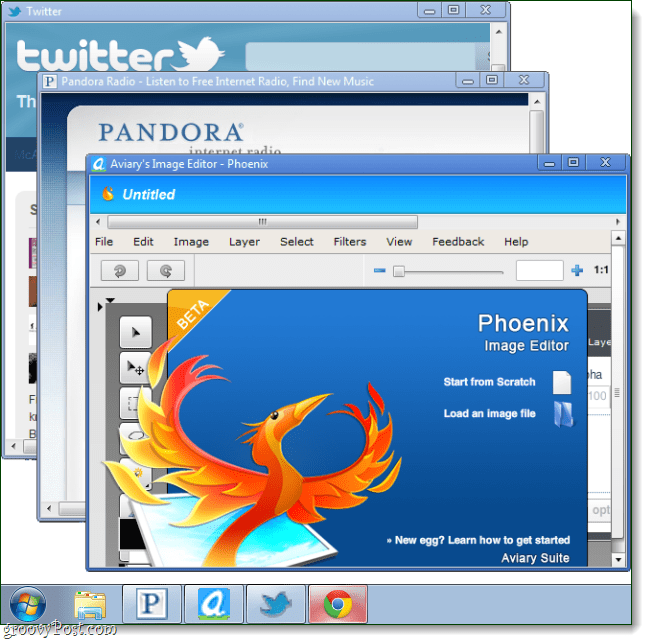 Internet Explorer 9 (IE9) is still new on the market, and one of the greatest features offered is the ability to pin websites to the taskbar. When a website is pinned, the browser then treats it as if it were a separate application. Certainly, Microsoft’s marketing department has done a superb job promoting the feature, they even partnered up with sites for promotional offers. We’ve shown you how to pin websites to the taskbar with both IE9 and Chrome, but despite Microsoft’s attempts -Chrome does it better. First, let’s dispel some of the magical vapor that Microsoft has touted about the feature. Pinned websites aren’t anything special. It is just a website that has its own place on the taskbar, and it is launched with certain parameters to make the browser change its window interface. Another thing to keep in mind is that you can pin websites to the Start Menu, desktop, or really any folder on your computer. For example, on my PC I’ve created the directory “C:\Program Files\Webapps” that I store my less-frequently used pinned sites in. Before we talk about how Chrome is better, keep in mind that IE9 has a small benefit that Chrome is lacking. 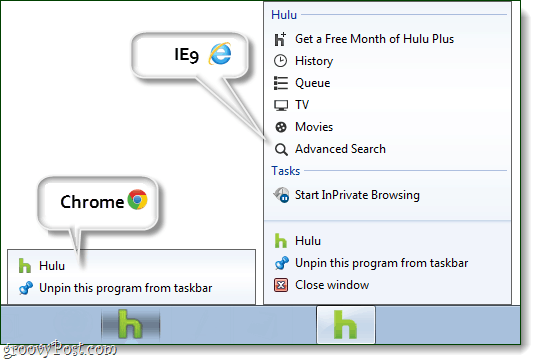 Pinned websites in IE9 have jumplists, and Microsoft has even paired up with different online companies to create incentives for using them. The problem is, most people don’t use jumplists. Sure jumplists are handy, but they force you to go against habit and Right-Click items on your taskbar to open things. Besides that they don’t even show up unless the website has specifically developed to support them; which most don’t. So, since we now know how similar they are for pinning websites, let’s look at what matters. As you see in the image at the top of this article, IE9 still leaves all the junk in. In fact, all IE9 does is add an icon next to the back button and change the coloring around a little. Internet Explorer doesn’t make a pinned site about the website, it’s still about the browser -which contradicts the whole point of pinning anyway. When you pin a website to its own shortcut with Chrome, it completely changes the browser window. The entire Chrome interface is gone, out of the way, on ice, capisce? Once you pin a website with Chrome, the browser becomes all about the website (or webapp on that site). If you’re just going to use a website for Pandora, you don’t need an address bar, back button, or even refresh button. Chrome makes the browser window look just as it should be; only a narrow title bar at the top of the window. Aside from the interface, Chrome also runs a lot faster and doesn’t run into playback errors on Hulu and other video streaming sites. 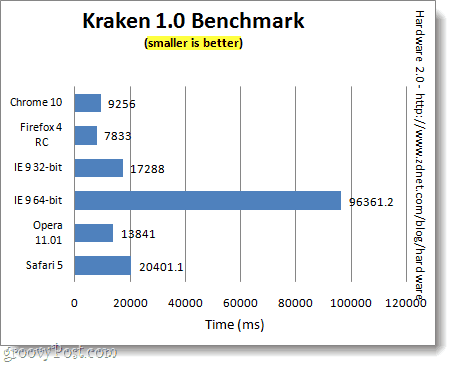 When put up to the Kraken 1.0 benchmark test on March 15th by ZDNet, Chrome 10 was close to twice as fast* –and Google has already released an update since then. *Note the 64-bit version of IE9 lags way behind. I like that with IE9, it keeps the tabs intact. I think this is a big improvement over Chrome, since I can still open several tabs when viewing one website. For example, in Facebook, I often find myself opening new tabs to view items my friends have shared. In Chrome, it opens a new window to do this. I think you are underestimating how people use jump lists. And you can control Pandora playback through the task bar preview window with IE9. Can Chrome do that? And IE9 is still the world’s fastest browser for graphically-intensive apps and games thanks to it’s full hardware acceleration. Chrome 10 doesn’t even support hardware acceleration. @Jon, great points all around. Chrome doesn’t have playback buttons in the hover-over preview. Full hardware acceleration does add a bit in IE9’s favor (depending on the GPU), in particular for personal computers. Chrome does have hardware acceleration, but it isn’t turned on by default. You have to go to “about:flags” to enable it. (hmm, I guess we kinda missed the How to for that one). On the other side, I work with a lot of virtual servers that aren’t compatible with that particular feature (though Microsoft says they'll be fixing it), but even after happens I still can’t picture our VM’s handling anything graphic intensive.